Challenging D.C.'s Tradition Of Unpaid Government Internships The White House and other government agencies are not required to follow the Fair Labor Standards Act when it comes to paying interns. Many interns struggle to survive in the nation's capital. White House interns are not paid and are expected to work from 9 a.m. to 6 p.m. Monday through Friday. The Department of Labor has guidelines for companies that want to keep unpaid interns. Essentially, unpaid interns have to be treated like students and shouldn't do the work of paid employees. Those rules, however, don't apply to government agencies. "If America runs on Dunkin' Donuts, D.C. runs on unpaid internships," says Carlos Vera, the founder of a campaign called Pay Our Interns. The campaign's guiding principle: how much money your parents make shouldn't keep you from getting work experience. Vera interned at the White House in 2014. "For any person that loves politics, it's a dream being at the White House," Vera says. "Once I was on that other side, I realized it's not as glamorous as sometimes you think." White House interns are expected to work unpaid from at least 9 a.m. to 6 p.m. Monday through Friday. Because of the full-time hours and the high cost of living in Washington, D.C., Vera says, unpaid government internships are out of reach for many people from low-income backgrounds. It's something that hits close to home for Vera. "One thing that the White House required is you had to bring in a suit every day," he said. "And that's something that they don't think about: Suits cost a lot of money. So my dad, my two aunts, and my uncle had to all pitch in money just so I could just buy one suit." According to Money magazine, interning for the summer in cities like D.C. can cost upwards of $6,000. In a statement to NPR, White House officials said while the internship is unpaid, interns can earn academic credit. Vera says many government agencies offer academic credit as a form of compensation. "At my university, school credit is [$1,467]," Vera says, referring to the per credit cost at his alma mater, American University. "You're paying to intern for free." Reynolds Graves interned at the White House in 2011 and says unpaid internships are a rite of passage. "You cannot put a price on the knowledge you obtain from an unpaid internship in these marble hallways, whether it's Capitol Hill or the White House," he says. 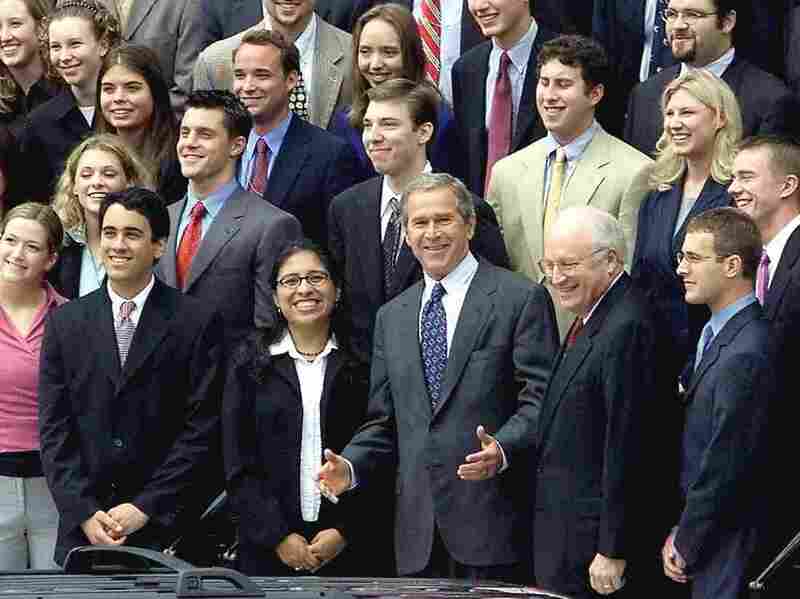 The White House internship was just one of the unpaid internships Graves did during college. He worked part time and dipped into savings to get by. "Maybe you've got to bus tables after work. You know, everyone else gets off work, you don't get to go hang out," Graves said. "There's no shame in that and I think that would even build more grit." Graves says interns can also seek out grant funding. That's what Ermolande Jean-Simon did when she was a White House intern. She got a $5,000 stipend from her alma mater, Boston University. But even with that money she still had to rely on family and friends to help her get by. "Without that kind of support, I don't think I would have even been able to even do the internship," she said. Vera says there shouldn't be so many obstacles for people from low-income backgrounds looking to do an unpaid government internship. "People shouldn't be precluded from starting a career in public service based on their socioeconomic status," he says. "That's so anti-American in many ways." Vera says his campaign is keeping a close eye on government agencies that don't pay their interns. As new elected officials come in, Pay Our Interns will be pushing to make intern wages a priority.